On this page you can open and, or, download current and past newsletters. Hard copy newsletters are available on application to the KASS Secretary, price £1.00 each issue. KASS are always looking for new items for the newsletter from its members: any features are welcome; stories of Scotland, holiday diaries, funny stories and jokes, poems, tips on dancing, quizzes, words of wisdom. Also please send any items of news about your society; recent dances, celebrations and news of your members. The current Newsletter is November 2018 and it is the 70th edition. Click on the image to open the current newsletter. 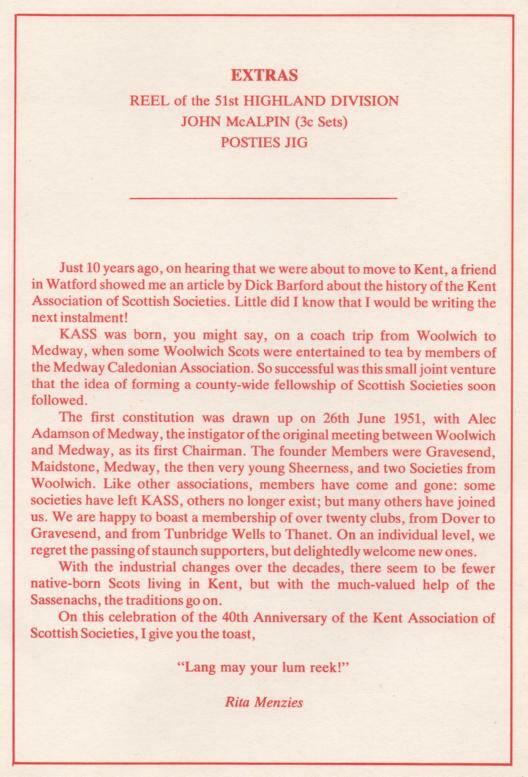 Many of the past Newsletters are available and they give a facinating insight on how KASS and the member clubs have developed over the years. We have copies of most of the old newsletters and they listed below. To open any of the files simply click on the image of the Newsletter. If you have hard copies of any of the missing Newsletters, the Newsletter Editor would appreciate a copy and we could add it to our archives here on the website. On June the 26th 2011 KASS was 60 years old. The attached note is from a programme that was prepared for the 40th Anniversay. Click the image to see it at the original size. "Kent International Festival of Dance and Song"